Munger: Several people in Bihar were gripped by the news that a child had fallen into a borewell, and throughout the evening many were glued to the live transmissions happening from Monghyr (Munger) on their smart phones. At about 10 pm, there was a huge sigh of relief and profound admiration for the Disaster management team and the way in which locals and district administration got the job done. Everybody present at the site clapped as she was finally taken out around 10pm on Wednesday. Nachhiketa Sow was visiting home when his infant daughter slipped and fell into the borewell. Emotions swung between hope and despair at the site where a large crowd had assembled. The police had to cordon off the area. 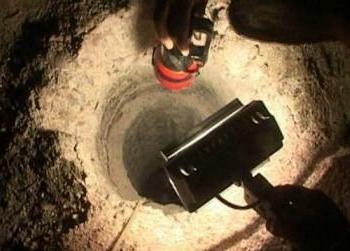 When they discovered the child in the borewell, her parents called residents for help. They tried to pull her out with a rope but failed. The borewell was around 200ft deep; the child was stuck at around 45 feet. The Munger administration brought in earthmover machines and around 30 men. Rescue operations began around 8pm on Tuesday. A horizontal tunnel parallel to the one in which the baby had fallen was dug up manually, as use of an excavator could have led to soil falling on the child. 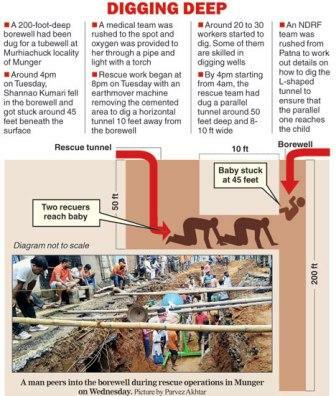 By 4pm on Wednesday, 24 hours after the child had fallen in, the State Disaster Response Force and National Disaster Response Force teams and the district administration managed to dig a 50ft deep tunnel parallel to the one into which the kid had fallen. All through, oxygen was continuously being supplied to Shannao through a pipe. However, it took over four hours to dig an L passage to reach her. Digging began after an NDRF team led by deputy commandant Balachand arrived from Delhi. A device was used to let the mother speak to the child in the tunnel. Hearing the familiar voice, the child responded, bringing cheer to all. Building the L passage took time as the rescue team hit on a rock and a rock-cutter had to be brought in. “The rock delayed rescue by two hours,” said a member of the rescue team. In between, rain too disturbed rescue work. The district administration put up a tent over the dug-up area. As evening set in, an ambulance arrived near the site and an ICU unit from Munger sadar hospital was alerted to provide quick medical treatment once the kid was pulled out. At least five doctors were at the spot. The last few moments appeared the longest as nobody was sure if the child was alive. The rescue team declared around 8.30pm that they had reached the child but she could not be extricated till 9.50pm as the rescue teams were being extra cautious. The rains had made the rescue work even more difficult. No doubt all were ecstatic at the rescue, but it must be brought home that carelessness on the part of the parents resulted in a huge expense to the state exchequer.